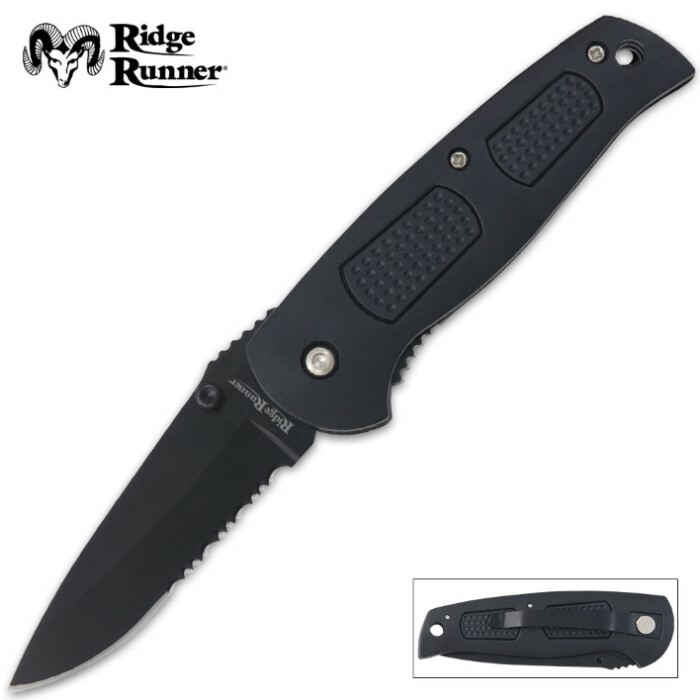 Ridge Runner Tactical Pocket Knife Black | BUDK.com - Knives & Swords At The Lowest Prices! Note: Color of blade may vary! 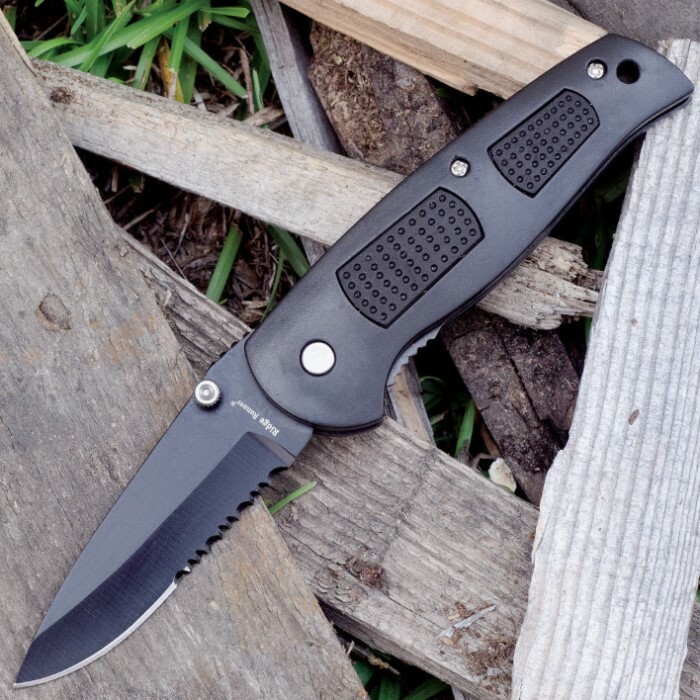 This tactical folder from Ridge Runner features a solid black coated, partially serrated 3 1/4" stainless steel blade. 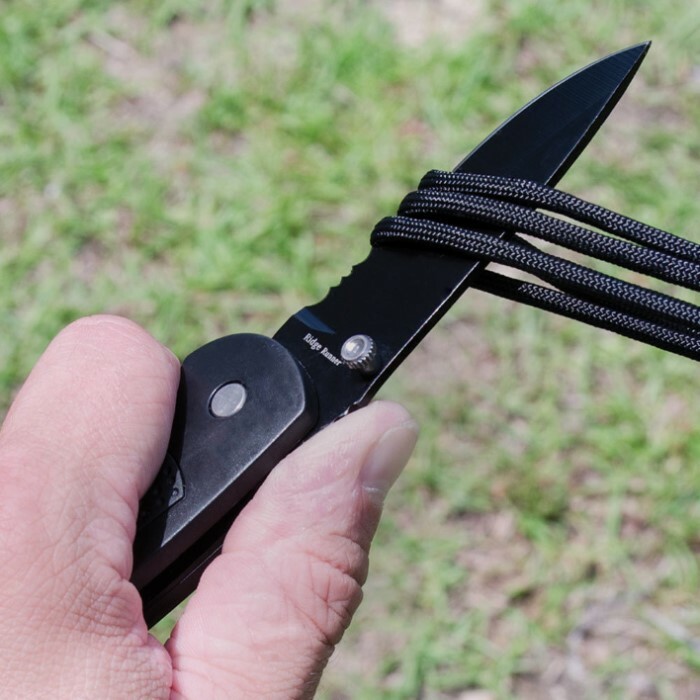 The handle is made of durable black ABS and features black pins and a black stainless pocket clip. Just got this knife and I have to say it is well made and is very comfortable in the hand , love this knife. good knife not very sharp but it is ok! This is a nice little knife which is functional for light duty chores, and an easy carry of good quality you may be happy you had at hand. For this price in my opinion you can not go wrong when this knife is used for light duty chores. Snaps open and locks in place well. I recommend getting several and sharing with friends and family who would appreciate this functional knife. This is a handy little knife to have around and it fits my hand well. It opens easily. Like the guy in the video said, if your using it for light duty stuff it's just fine. I've opened a few cardboard boxes with it so far and cut a small diameter piece of rope with the serrated edge. I'm not expecting a lot for a dollar 98 but I think the knife will give me more than I bargained for. Mine came with a black blade, which was just fine with me. I threw this in with one of my last purchases and I'm really happy I did. The handles kinda cheap feeling but the blades sturdy and the build holds up. One important thing the blade might not be the same color as in the picture mine came all blacked out which I didn't mind. Response: We apologize for this inconvenience, thank you for pointing that out. We have pulled one from stock and see that the blades are in fact black, we are updating the images to reflect this. Ok, truth be told, for $2, as long as you don't preconceive any expectations you'll be very pleased with these. For a knife collector and everyday user like me, these are like the knife version of what a disposable lighter is to a zippo, they will hold up but won't win any beauty contests and aren't going to cause tears if you lose one. It won't be your favorite knife or even close but they are the prefect giveaways, box cutter alternatives and a perfect gift for a kids first pocket knife. I give them away to my nieces and nephews who live in Montana and Texas, to my Mechanic and to friends who work with box cutters frequently and they all seem to enjoy them. I suggest buying a handful or in bulk and throwing them in BOBs, tackle box, glove box, and around the house like I do, as a just in case knife. I also suggest giving them to women in your life, as in this day and age, nobody can be too careful. I gave one to my mom and girlfriend and they both love them. Overall for $2 I can't see anyone justifiably complaining.